Y’all. I feel like I have been away from the blog for so long. As I’m sure you’ve noticed, my posts and projects have been sporadic over the last few months. Tomorrow, I’m jumping right back in with plenty of DIY and home decor goodness to make up for it! But until then, I am dying to update you on what’s been going on in our world. For the past three years, Tom and I have managed a team (and sometimes more than one team) of elementary school students in a program called Destination Imagination, or DI for short. DI is a program that teaches kids how to use collaborative problem solving and creative thinking skills to address open-ended challenges. The teams present their solutions in tournaments around the world. Kids from Kindergarten through University can participate, and I participated myself when I was in high school. But now as team managers, Tom and I can’t offer suggestions or help to the kids, so the solutions that they showcase are completely theirs and theirs alone. Sometimes, their solutions excite us, and other times, they make us absolutely crazy. The first two years, our teams struggled in finding the sweet spot in collaboration. There were arguments and struggles, and they never really placed higher than middle of the pack in our Regional tournament. These were super creative kids, but they just couldn’t figure out a way to work together without turmoil. Tom and I were disappointed, because we knew that they had it in them, and we hoped that they would at least be able to look back on DI later in life and remember some of the problem solving skills that we worked on. Tom always said that if he helped instill that in just one kid, all of the time and resources we put into the teams would be well worth it. He’s definitely right about that. This year, we decided that we’d give it one more try. I don’t know if it was fate or what, but we ended up with a smaller team than usual (5 instead of 7), with only 3 of the team members having participated in DI before. But after our first few meetings, we knew that this team was going to be different. The Sugar Rush Monkeys, as they decided to call themselves, selected Lose to Win as their Central Challenge from the DI program. To solve the challenge, the team had to design and build a lightweight structure out of specified materials that would support weight while parts of it were removed, design and build a device that enabled them to safely remove parts of the structure, tell a story about how something is transformed and revealed to be something completely different, create a prop or set piece that transforms as parts of it are removed during the presentation, and create two elements in the presentation that show off their interests, skills and talents. They also had to prepare to solve an unknown problem that they were given on the spot on the day of the tournament (this is called an Instant Challenge). In other words, DI requires that these kids become engineers, builders, researchers, creative thinkers, actors, artists, costumers, scriptwriters, and storytellers – all at 8, 9 and 10 years old in our case. Oh, and they had to do all of this in our garage after school and on weekends, because DI is not a class on our campus like it is in other schools. Tom and I knew from the moment this team got together in early November that they were different. Only two of them came onto the team as friends, but they developed a bond (across grade levels even) in a matter of hours. Together, they were able to collaborate quickly and really come up with creative solutions to their Central Challenge. They were also able to solve Instant Challenges without a lot of arguing and infighting. As we worked with them over the school year, they were able to separate their personal selves from their ideas so as not to be “hurt” when their suggestion wasn’t the one that the team went with. That is an incredible trait in a group of 3rd, 4th and 5th graders! DI is really about the journey, so these kids were huge winners before we even went up against other teams. We were amazed at what we were seeing. 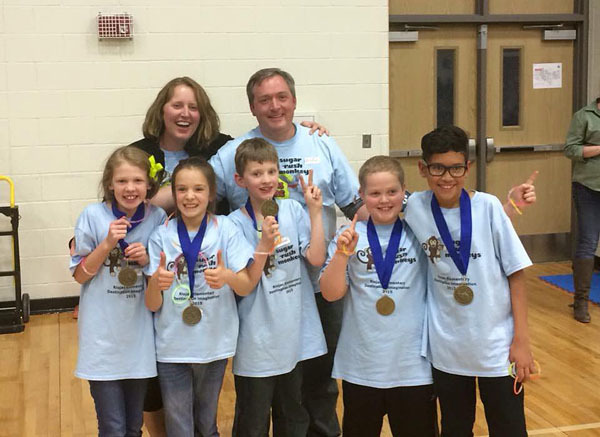 The Sugar Rush Monkeys went into their Regional tournament in March and really performed well. We were so proud of them! We knew that our region (the largest in Texas) is incredibly competitive, and we hoped they’d at least place in the top 6 so that one of our DI teams could finally earn a medal. At the awards ceremony, they announced places 6th through 2nd, and Tom and I got a little depressed that our names weren’t called. “Man, the other teams must have really brought it this year,” we thought. But when they announced 1st, we all stared at each other for a few moments before it sunk in. The Sugar Rush Monkeys won first place (out of 20 teams), which advanced them to the State tournament! What happened at the State tournament? Well, a lot! I’m going to have to leave you hanging on this story since this post is already so long. I can’t wait to tell you more about these kids and how they have changed over the course of the school year. And of course, I can’t wait to tell you why I think YOU and your child needs to get involved in this fantastic program. Are you familiar with Destination Imagination (or a similar program called Odyssey of the Mind)? Are your kids involved? Tell me all about it! That is awesome! I’d love for my boys to be involved in something like this. You should totally look into seeing if they do either of these programs in your area! They are lots of fun! This was our first year with DI. I managed a team for each of my boys- one Rising Stars and one of 7 5th graders. My Rising Stars won a Renaissance Award and the 5th graders placed first at Regional. Not bad for a first year! We had a heart breaking showing at the Ohio State competition. They competed in Creature Feature, and due to the chaotic atmosphere in the large gymnasium, the judges were not able to hear one of the sounds their creature made. Those missed 5 points cost made the difference between placing 5th (top 4 went to Globals) and placing 3rd. It was a very tough learning experience that took the sheen off what was a spectacular season for our first DI experience. Oh, I hate to hear that, Megan. 🙁 That is very tough, but it sounds like your team performed incredibly well!. Our first year, one of the tournament provided pieces wasn’t built to the specifications from the challenge, and it proved to be difficult for the kids to maneuver (it didn’t slide as easily as it should have). It was definitely a learning experience for them to learn how to adjust on the fly, and now we have them talk a lot about what they’ll do if things don’t work as planned. That’s exciting that your Rising Stars won a Renaissance Award! Our RS teams don’t win special awards in my region. How did you feel about managing 2 teams? We had a competitive team and a Rising Stars team this year, but I don’t think we can do that again. It was way too crazy! Managing two teams was definitely crazy, so I totally identify with your post photo. Both teams met after school and had practice concurrently- I will not do that again! Half of my RS will be too old next year, but instead of moving my son up to stay with them, I’m sticking with RS for his 2nd grade year. I just don’t think I can handle the pressure of two competitive teams yet. That’s awesome that your husband is involved. I had one grandparent that helped with both teams, but I still held the bulk of responsibilities. My husband was an appraiser at both tournaments. Yes, involved parents are KEY! It’s a whole lot of work for one person to do – even for two people. When you are doing something that takes this much time, you need all the help you can get! I loved Odyssey of the Mind as a Kid and briefly tried to sponsor a group for my kids a couple of years ago but it never took off and I found the guidance for the coaches to be lacking. I’m very excited to hear more about DI! Awesome! I have lots more to say about it. LOL Stay tuned! We have something similar in Australia called Tournament of the Minds. The team picks which section they want to compete in. They have a prepared performance and a spontaneous performance. The first year my son competed they won the region, then won the state final … No team from his school had ever progressed this far. They went to the international round and lost, but it was amazing. The next year his team entered a different section. They didn’t progress past regionals, but my son’s performance in particular was jaw dropping …. All from a kid with autism who struggles with body language etc. it was so stunning. I am hoping my next boy is invited to participate this year. We love it! Congrats to your team!!! This is AMAZING! Don’t you love seeing the changes in the kids? I really think these programs are so important for kids, as they teach them life skills. I mean, what elementary child really understands what it means to work as a team and to think creatively and collaboratively at the same time? I am so excited for you and your son! 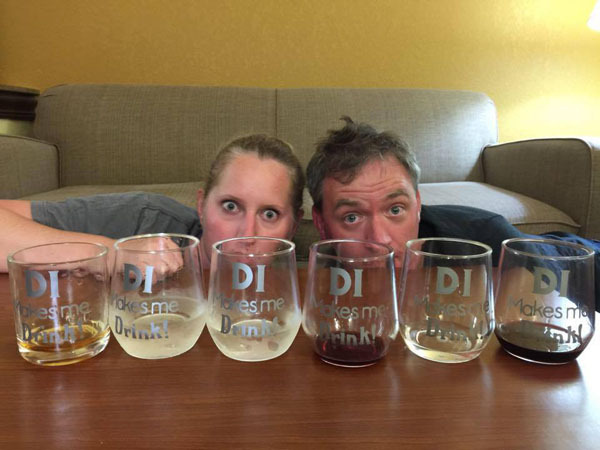 Hi Lindsay, how does one get more information on DI? I live in the same area as you (we have emailed each other in the past for other things). My son (going into 6th grade next year) is in Boy Scouts but is no longer enjoying it and wants to stop. I am wondering if this would be something he would enjoy. Being an only child, I really want him involved in some activities that doesn’t involve video games!!! Hi Kim! I’m going to email you so we can figure out exactly who your DI contact would be! It’s such a great program! Hey Linds!!! Can you email me info regarding DI in our area? How awesome this has been following yall!! Congrats and we should plan another trip soon! Thanks, Dace! I’ll email you!